When you land at Buttercup Bingo for the first time you may well find yourself humming the tune ‘Old MacDonald’. Buttercup appears to be the name of the mascot for this brand and she’s a cow – we don’t mean that detrimentally, she literally is a cow! The home page sports barns and fields alongside bales of hay but sadly, the theme is not carried through into the rooms. 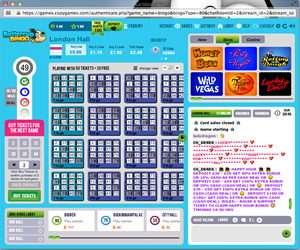 The site opened in May 2014, one of several online now to be powered by the Cozy Games software and part of the Live Bingo Network (LBN). If you’re a stalwart fan of these products then you’ll probably be well aware of what we are about to tell you – if you have accounts at any other brands on this network, the chances are you are going to have a real drama registering with Buttercup Bingo or, even if you manage it – will not be eligible for the bonus. It’s infuriating to say that least but just one of the many issues we have with Cozy Games products. 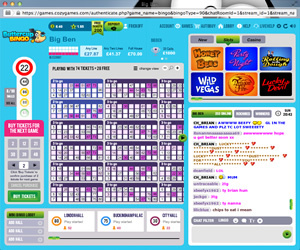 You should note that you might be able to use your login detail from other sites on the LBN to play at Buttercup Bingo. Once you have gotten past the registration process you are taken to the main lobby and it is here that you can choose the room you wish to play in. Buttercup Bingo offers quite a variety of rooms to play in but there is plenty of information in the lobby to help you make a decision that suits your requirements and budget. You can see the game type, the number of players, the ticket price, the house prize and the Progressive jackpot amount if one is available in the room. Step into your chosen room and if you have played at Cozy sites before, you will feel right at home. Other than the design, the overall layout of a bingo room remains the same. You will find your purchasing options to the left of the screen but when a game is in play, this becomes the callboard. To the centre of the screen are your bingo tickets with the game prizes above them (including details of the progressive jackpot on offer and how to win it). 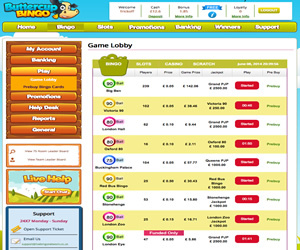 The chat room is to the left and above it are the instant win games available. 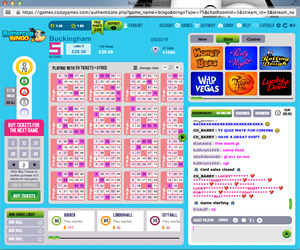 Talking of chat, as with other brand on the same network, there is the same issue at Buttercup Bingo as we have found on other sites – the hosts are a little over zealous in their use of the smilies available which makes participating in chat a little difficult. We found our eyes went a little ‘screwy’ after a while. When it comes to promotions, Buttercup Bingo isn’t a market leader that’s for sure. There’s little more than the deposit bonuses on offer – nothing really to get your teeth into. That said, these sites appear to be becoming more and more popular and the prize money on offer in the rooms isn’t too bad. With the minimum deposit before withdrawal at just £10 and the minimum withdrawal amount at just £30 – the wagering and withdrawal issues aren’t what they once were at the Cozy sites but you should note, you can only request a withdrawal once in any given seven day period – a little ‘Build you up Buttercup before they knock you down again’ maybe? 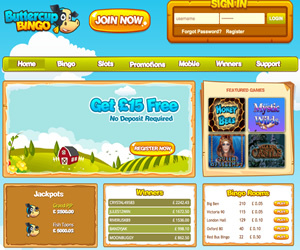 Buttercup Bingo offers three variants of the online game when we visited; 75 ball, 80 ball and 90 ball. However, we do know that the Cozy Games software also boasts 30 ball bingo. Additionally you will find an array of instant win games and what we like about the Cozy sites is that you can use your bonus funds to play the side games too. Wagering requirements on deposits vary at Buttercup Bingo dependent on the option you choose for the bonus - bonus funds or cash. For bingo the wagering requirement if bonus cash accepted is 4x the amount of deposit + bonus received or for any other game besides bingo it is 10x the amount of deposit + bonus received. You should note that you can only request one withdrawal in any given seven day period at Buttercup Bingo.